Intervention research to reduce disparities in breastfeeding behavior and improve health outcomes for vulnerable infants. 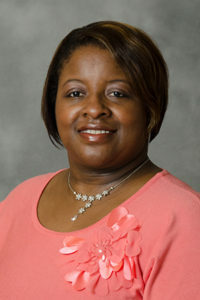 Urmeka Jefferson joined the SON in August 2012 after completing her doctoral degree in nursing at Saint Louis University. She has over 16 years’ experience working in the NICU, WBN and postpartum as well as teaching experience in undergraduate nursing programs. Dr. Jefferson’s research focuses on reducing disparities in breastfeeding to improve morbidity and mortality of vulnerable infants. Her scholarly contributions have been in three main areas: 1) the association of infant feeding attitudes and exposure to breastfeeding intentions; 2) determinants of breastfeeding behavior among African American and rural women; and 3) use of technology to improve access to breastfeeding support services. Dr. Jefferson has designed the Mother’s Milk Connection app to support breastfeeding women after discharge home from the hospital. She is currently focused on research aimed to explore effectiveness of the Mother’s Milk Connection app to increase patient engagement during pregnancy through early postpartum and improve breastfeeding initiation, duration, and exclusivity. Jefferson, U. T. (2017). Breastfeeding exposure, attitudes, and intentions of African American and Caucasian college students. Journal of Human Lactation, 33(1), 149-156. Majee, W., Jefferson, U. T., Goodman, L., & Olsberg, J. (2016). Four years later: a qualitative study of US rural mothers’ and employers’ perspectives on breastfeeding barriers following the passing of the affordable care act. Journal of Health Care for the Poor and Underserved, 27(3), 1110-1125. Goodman, L. R., Majee, W., Olsberg, J. E., & Jefferson, U. T. (2016). Breastfeeding barriers and support in a rural setting. MCN, The American Journal of Maternal/Child Nursing, 41(2), 98-103. Jefferson, U. T. (2015). Predictors of breastfeeding attitudes among college-educated African Americans. Research and Theory for Nursing Practice, 29(3), 189-199. Conn, V., Zerwic, J., Jefferson, U., Anderson, C. M., Killion, C. M., Smith, C. E., Cohen, M Z., Fahrenwald, N. L., Herrick, L., Topp, R., Benefield, L. E., & Loya J. (2015). Normalizing rejection. Western Journal of Nursing Research, 38(2), 137-154. Conn, V., Topp, R., Dunn, S., Hopp, L., Jadack, R., Jansen, D., Jefferson, U., & Moch, S. (2015). Science on a shoestring: building nursing knowledge with limited funding. Western Journal of Nursing Research, 37(10), 1256-1268. Jefferson, U. T. (2014). Looking beyond skin color: Addressing heterogeneity in health disparities research [editorial]. Western Journal of Nursing Research, 36(10), 1307-1308. Jefferson, U. T. (2014). A review of literature regarding determinants of breastfeeding among black women in the United States. The Journal of the National Black Nurses Association, 25(2), 55-64. Jefferson, U. T. (2014). Infant feeding attitudes and breastfeeding intentions of black college students. Western Journal of Nursing Research, 36(10), 1338-1356. Jefferson, U. T., Zachary, I., & Majee, W. (2017). Implementation of Telehealth for Postpartum Breastfeeding Support. University of Missouri Nursing Outreach 3rd Annual Perinatal Nursing Conference. Columbia, MO. Jefferson, U. T. & Majee, W. (2017). Breastfeeding Barriers and Support in a Rural Setting: Closing the Gap. National Association of County and City Health Officials (NACHHO) Webinar Series, Breastfeeding in the Community: Engaging Rural Families. Jefferson, U. T. (2017). Breastfeeding Exposure, Attitudes, & Intentions of African American Women. ROSE 6th Annual Breastfeeding Summit: Achieving Health Equity Through Breastfeeding. New Orleans, LA. Jefferson, U. T. & Bloom, T. (2016). Determinants of Breastfeeding Behavior among African American Women. Association of Women’s Health, Obstetric and Neonatal Nurses Annual Convention. Grapevine, TX. Jefferson, U. T. (2014). A Systematic Review of Factors Associated with Breastfeeding Decisions among Black Women. Midwest Nursing Research Society Annual Research Conference. Saint Louis, MO. Jefferson, U.T. (2013). Contribution of Breastfeeding Exposure and Attitudes to Breastfeeding Intentions of Black College Students. National Association of Neonatal Nursing Annual Educational Conference. Nashville, TN. Jefferson, U. T. (2013). Breastfeeding among African-American Women. Grand Rounds, University of Missouri Women’s & Children’s Hospital. Columbia, MO.